Black Special Forces Tactical Glove with kevlar and extended cuffs. 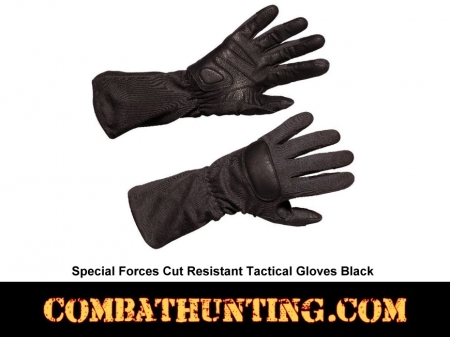 Ergonomic cut and fit kevlar shell provides cut resistance and flash protection to 800 degrees f(427 c) water resilient two layer leather palms elasticized wrist keeps these gloves snug and with little slack. Non-skid material in hand cradle provides exceptional grip when handling weapons foam padding on backs. Available in sizes: sm - 2x.